"Manage multiple Enterprise projects from start to finish with Wrike. Perfect for your Marketing, Creative, Operations, IT, and Project teams of over 20 people. " 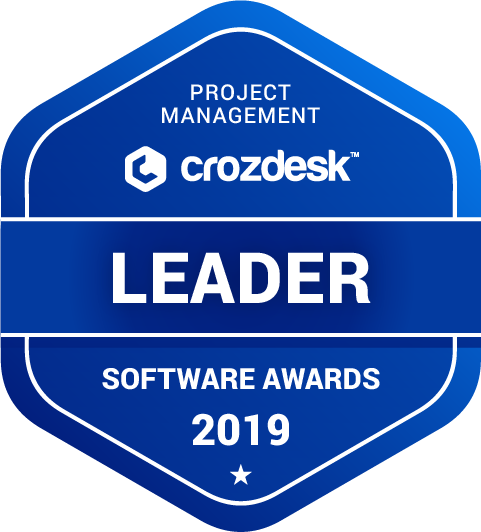 Wrike scored 86/100 in the Project Management category. This is based on user satisfaction (80/100), press buzz (52/100), recent user trends (rising), and other relevant information on Wrike gathered from around the web. Wrike is a project management software that aims to streamline the workflow of projects in order to get them done faster and with more efficiency. A common problem that companies face when handling big projects that have a lot of dependencies, resources, and stakeholders is that it can get too complex and will, therefore, be hard to track. Wrike is a solution to that issue by providing a solution wherein projects can be created, planned, executed, and relayed to the right people all in one place. Wrike is easy to use and flexible and is a good fit for companies and projects of all sizes. With this software, companies are able to create timelines, make use of the integrated time tracking, and create tasks that will only be shared with the pertinent people. It gives users the ability to get a real-time view of the project at any time and is also accessible even on mobile phones and tablets. With Wrike, users are able to simplify projects into folders and tasks, streamlining greater efficiency. The simplification also makes them less complicated, which further saves time and effort. In the dashboard, users are able to create their own folder for different projects. They are also able to add subfolders so they would be able to break the whole project into its core components. For example, if a company were to have a website design project, the first subfolder could be labeled as brainstorming, the next one initial design, and so on. Next, users are able to add tasks to the parts of their project. When creating a task, users are able to add a name to it, assign it to certain members of the team, and set the schedule as well. In task creation, users are also able to set three different types of tasks. The first one is “backlogged” tasks that are characterized by having no dates in the schedule. These are tasks that have no exact date assigned yet. Users may also use these for storing supporting documents and files. Take note though, that these backlogged tasks do not show up on the to-do list because of the lack of dates. The next type of task is the “planned” task, which has both a start and an end date. This is useful for tasks that need to be accomplished in a certain amount of days. The last kind of task is called a “milestone.” These tasks have only a single date and they basically mark important points of the project’s timeline. Users may also set the status of tasks depending on what state it is currently in, be it active, completed, deferred, or canceled. After that, users are able to use the timer. This feature of Wrike tracks the minutes or hours that team members use while doing tasks in projects. Members are able to log their times spent, as well as document what they did with that time. Users are also able to set dependencies in order to manage the timeline and work order of certain tasks. However, this is only for those tasks that have a strict timeline, and users are always able to leave this part blank or unchanged. Another part of Wrike’s task manager is the sharing feature. Here, users are able to set who is able to see certain tasks of the project. Documentation is also one of the key features of this software, as most windows show who created what at what time, and who can see what part of the project. A step above of the sharing feature is the follower feature. This includes the person who created a project or task, as well as people who are shared in. These are the members of the team who will receive email notifications from Wrike when changes are made in the tasks. For those who receive these notification emails, they have the option to open up Wrike to see the update. Alternatively, if they want, they can also simply reply to the email and this will then show up as a comment on the task, which means the recipients of these notifications don’t have to open Wrike to give feedback. For those office documents like Word or Excel that are uploaded into the Wrike repository, users are able to edit those directly in the Wrike interface. Users don’t have to open other programs, edit the file, save, and then re-upload the file in order to update it. For other files that are not compatible, users can then download and then edit it using the program of their choice. All activity made in the task is tracked and can be seen by members of the team that the task is shared with. As well as tasks, users are also able to share the main folder with certain people so they can view every aspect of the project. Wrike is able to efficiently fulfill what it aims to do, which is to make it easier for users to create, track, and share tasks of a project. Almost every action made within the software is documented, which gives visibility into who made what changes. Details are easily seen on the interface, so users need only glance at it to learn everything there is about the project or task. Everything is easily accessible within the platform, and because of its multiple integrations to other third-party software files, you don’t need to use other programs just to change something on a certain file. They can also even leave comments on the software without necessarily opening it. The interface is designed so anybody can easily learn to navigate what they need in order to make full use of Wrike. Wrike currently has four payment plans available for companies to take advantage of. However, there is also a free plan that supports up to five users that are included—and the other packages that users need to pay for also have a free trial period. The free plan already features file sharing, management of tasks, and a real-time activity stream. It also allows for a spreadsheet view of the entire project and its tasks, and also has basic integrations with Google Drive, Dropbox, OneDrive, and others. It also features applications for both Android and iOS and has 2GB worth of storage space. This package has all the features that the free version has, and more. It now has subtask management, a dynamic timeline, and also allows advanced integrations like for MS Project and Excel. Shareable dashboards are now available and an unlimited number of collaborators may be added. It now also has 5GB worth of storage space and an additional 15GB worth of video uploads per month. Aside from the features the Professional Package has, this payment plan also has customizable fields and workflows, report templates, and real-time report sharing that comes with scheduled notifications. It also has graphical analytics, resource management, and request forms. Integrated time tracking is now available, as well as Salesforce connectivity and a branded workspace. Users are may now be put into groups, and storage goes up to 50GB as well. On top of the features that the Business payment plan has, this also has video proofing as well as an Adobe CreativeCloud extension. This plan also allows for tailored workspaces. This plan also has business package features, and it has tighter security and more optimized controls. This package allows active directory integration and SAML 2.0 single sign-on authentication. It has customized password policies, IT-controlled admin permissions, and user audit reports. It also has network access and compliance policies as well as 100GB for storage space. 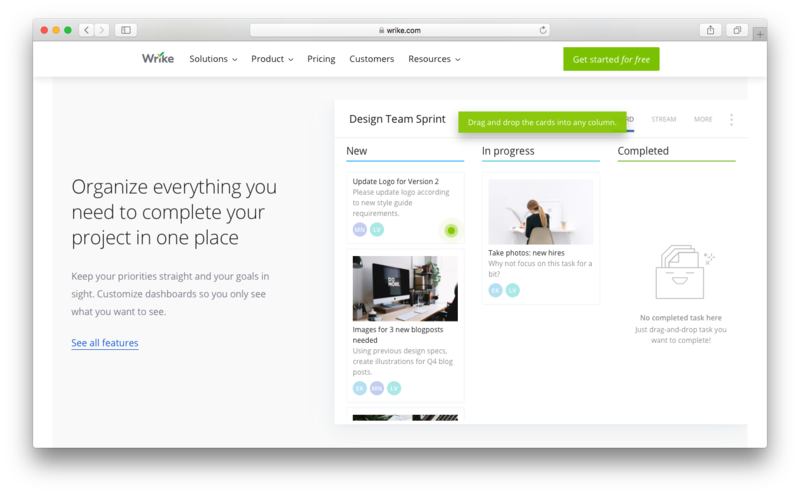 When people look for a one-stop, all-in-one project management tool, they should consider Wrike. Its custom functionality and its ease-of-use make for a handy software that is robust and yet easy to use. As a result of its mobile applications you can check the status of tasks and projects on the go, and as long as you are on the follower list, you are sure to be notified whenever there are things that need your attention on a task or project. 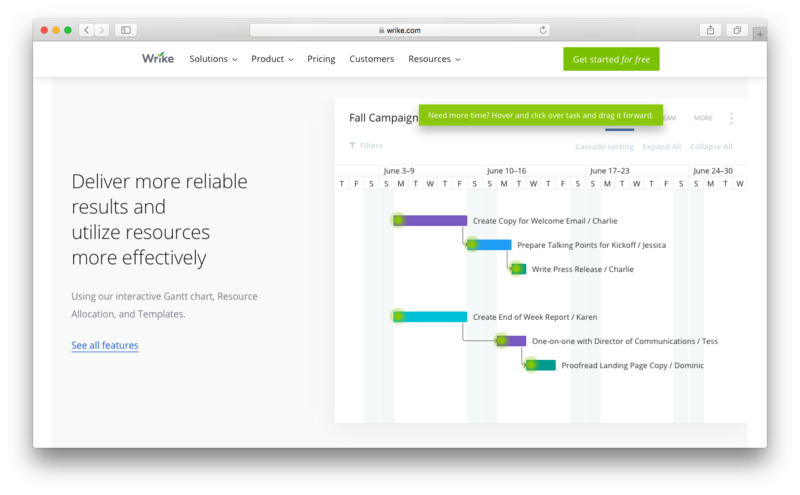 For making sure your project timeline is expedited, Wrike is definitely worth a try. 3.98/5 based on 1323 user ratings. What do you like about Wrike? and videos to provide specific information. What do you dislike about Wrike? to keep in mind that you have to change the work delivery date manually so that the updates are made. and that is somewhat tedious. What have you been using it for and what problems did Wrike solve? chain linked with other employees and shows what task they produce at each moment and who performs them and in what precise order as in the present, you can add the electronic mail so you will be informed of the monumen in which you must start or finish the work. Powerful tool to streamline the workflow. As powerful as it is useful software is very easy to use, it offers very good tools for project management as well as to streamline the workflow, it is available for several platforms such as Windows, IOs and Mac, its interface is very easy to use and extremely comfortable so that adapting to this tool is very simple. Their costs are somewhat high since each plan is adjusted to the number of users. The fact that we can streamline the workflow in a much simpler way is a great advantage because this software allows us to visualize in real time how the management of each project progresses, what each person does and if it is necessary to assign a task without sending emails It may take time to arrive or be seen, that is why this tool is very suitable for the business level, regardless of the type of company in which it is used. The management of projects is ideal with Wrike, with the Gantt diagram, tools for personalization, structuring and administration I can automate and manage on a large scale each and every one of the business tasks. It is totally reliable and represents professional scalability for my company. Maintains communication with each member of the work team and allows progress to be made in a coordinated and progressive manner. Managing and executing reports is a bit complicated, sometimes I do not understand it at all; The Gantt chart is an excellent help but you have to maintain a good training to do it correctly. We use Wrike com lifesaver, to coordinate teamwork and progressively manage the workload. The benefits have been escalating more and more as we move forward in the projects. We obtain that our planning and management of projects are rewarding when receiving good rewards of our work. Mar 28, 2018 Omar Allison // Sales Manager at Continental Steel & Tube Co.
Wrike allows you to quickly find discussions of projects that were conducted two, three months ago. Wrike is easy enough to use and simple in the settings that you need. Very convenient reports that are formed by pressing just one button. Unfortunately, the program does not slow when the robot comes from different browsers. There are small problems with speed when tracking in desktop app. With the help of Wrike, we have become better organized, everyone knows their tasks. Improved control over staff. With this program you can conveniently organize the necessary tasks, schedules, files in one place and watch the progress of any current project. This is a very good method of communication, in which I can easily save the conversation history. An easy way to solve the workflow for projects in such a way as to report all working teams. Task management, collaboration and transparency under the workload. This also gives me the opportunity to add an unlimited number of participants, which I really like. With this program, I can also manage marketing projects and engineering tasks. Some of the functions are hard to learn how to use, because there are a lot of them. I think that the program needs to be improved as soon as possible, because sometimes we need a mobile version, and the program works very slowly. With this platform, you will discover how creative you are. You can think and create new ideas, and then you can make them real with this excellent program. I definitely recommend this platform to everyone. I love that Wirke allows my team and I to keep track of multiple projects all at one time. My biggest complaint about Wrike is that there is a learning curve. It takes a little to learn how to use it efficiently, and honestly, we're still learning new ways to use Wrike. We are a web development and graphic design department within a material handling company. We are using Wrike to track all of our projects progress and even as a brainstorming tool where we can get our thoughts recorded before they're forgotten. we manufacture Bespoke Joinery, with each project on average containing 5 items which all need to be designed, procured, built and installed. Wrike is an excellent tool to keep track of each of these individual tasks, allocate the work to an individual and ensure all members of the team are aware of required dates and the importance of each task. Nothing. the only struggle was getting buy in from all the team members but generally once they start using it fully they are converted. generally it's used for project management, but we also keep track of top level business activities using the check list functions. Being in a deadline driven environment, Wrike adds a layer of accountability to our team. Each day the team comes in to work, logs into Wrike, and immediately knows what tasks they need to work on for that day. The automation from wufoo, through zapier has helped us to become more automated. Wrike could make their new forms addition more detailed and user-friendly. Currently there are not filters that can be used to automate tasks based on submission information on the form. Also, the timeline calendar is a terrible view. It would be better to have a monthly calendar view to access so we can see out 30 days. It's great for adding visibility into the work stream. Once you learn the product it's very easy and quick to use. Setting up a full project schedule in the system barely takes any time at all. The system seems to have a bit of a learning curve. It took a while for the team to understand the difference between a project vs. task, and what shows up in the left side project list. Additionally, some features are a little confusing (like the project description pane which looks exactly like the task description pane) and that took a lot of explaining with the team. I am front loading my characters. I am waiting on the effort portion to be built out. It is taking some time but they release new feature all the time. Wrike has helped me (and hopefully my team) get organised. I use Wrike daily to keep track of my To-Do's and ongoing projects. I find the Wrike platform easy to use and fairly intuitive. When starting out with Wrike it was initially daunting by how complex it looked, but by using it and learning all the time-saving features it gets easier day-by-day. The hardest part of Wrike is getting set up. Many of my team are not accustomed to web-based platforms or social media so for them, the switch from email to Wrike has been difficult. Without the support and encouragement of an experienced Wriker it has been quite difficult for them to get started. The website is also very slow on PC's (Mac's are fine), with significant lag between input and execution that adds an extra layer of frustration for these already out-of-their-depth users. 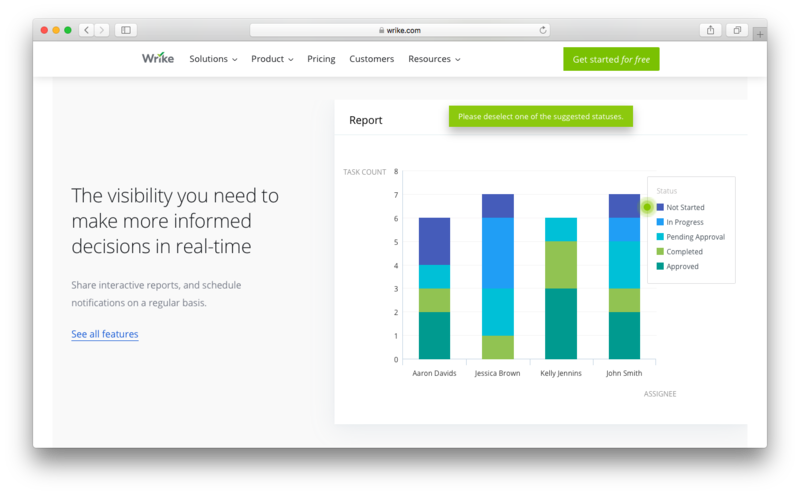 Wrike has made the design briefing process so much easier than our previous excel spreadsheet. Creating the request form with mandatory fields has reduced the amount of backing and forthing that usually goes on. After a few initial hiccups my team has embraced the new request system and things are now running smoothly. The options to follow and manage your tasks and how you can cooperate with others. That is a relatively new program with it has a lot of potential. Hopefully one day all the power will be unleashed. I use the timeline feature the most within Wrike. I find it to be very helpful in keeping all of my projects on task. Initially setting up projects was kind of difficult because there are so many different ways to handle projects. First I needed to come up with a template that I could follow and then it was smooth. Keeping everyone on the same page! I like that Wrike allows our whole team to stay on the same page when working on projects together. I am able to easily update where I am on a project and the supervisor can see my progress at any time. It took me a bit of time to get used to it, but I had a good teacher and the support team is the best! I'm so glad our team picked Wrike for project management! Wrike helped us to stay on the same page while avoiding the tendency to "micro-manage" projects because we had no other way of knowing where a project was on a given day. I like being able to have clarity of expectations in a collaborative environment with simple features and very usable interfaces that make the focus shift to communicating and not to tracking. I would like for it to have better user control features for admin purposes. Nevertheless all feature requests (which are good and make sense) are implemented with care. I have been using the tool to provide management with program visibility into all the projects and streamlined the reporting processes. - Communication flow. This will help you receive less emails everyday because it is very easy to communicate with team members through the app and on the tasks, even do meetings. - Productiveness. You will have all the tasks that you need in hand in order to perform. - User friendly. Anybody can learn to use it pretty quickly and with dashboards, reports and other tools you can increase your productivity in no time. The whole team needs to be into it and use it fully. If some people don't really like it and don't use it as much it's not the same dynamic. Project management. Whenever i've had problems they have listened to them and their customer support as well as feedback is really quick. Wrike is a great project management solution that has made us more efficient and better at what we do. Their support staff are the best! It isn't really a complaint, but it can take some time to get to where you are really comfortable with maximizing all the features. We use it to keep our team on the same page throughout a project and to track the project's progress. It has been instrumental in keeping us organized!